ASEAN is a geo-political and economic organization of 10 countries located in Southeast Asia. It was established on 8 August 1967 in Bangkok, Thailand, with the signing of the ASEAN Declaration by the 5 original members, namely Indonesia, Malaysia, Philippines, Singapore and Thailand. Brunei Darussalam then joined in January 1984, VietNam in July 1995, Lao PDR and Myanmar in July 1997, and Cambodia in April 1999, making up what is today the ten Member States of ASEAN. ASEAN has a population of approximately 580 million people, 8.7% of the world population. In 2009, its combined nominal GDP had grown to more than USD $1.5 trillion. If ASEAN was a single country, it would rank as the 9th largest economy in the world in terms of nominal GDP. In January 2010, China came to an agreement with ASEAN to form a new free trade area incorporating China and the six founding members of the Association of South East Asian Nations (Asean). They plan to eliminate tariffs on 90% of imported goods. In terms of population it will be the largest trade area in the world, with nearly 1.9bn people and it includes some of the leading export driven economies. The European Economic Community (the EEC) came into being with the signing of the Treaty of Rome in 1957. It came officially into operation on January 1st 1958. The EEC aimed to create a common market, a customs union plus free movement of capital and labour. The original six members were Belgium, France, Italy, Luxembourg, Netherlands and West Germany. Since then, it has grown in size through enlargement, and in power through the addition of policy areas to its remit. Denmark, Ireland, and the United Kingdom, joined in1973, but Norwegian voters rejected membership in a referendum and so Norway remained outside. Greece then joined in 1981, and Spain and Portugal in 1986. In 1986, the European flag was adopted for use by the Community and the Single European Act was signed. 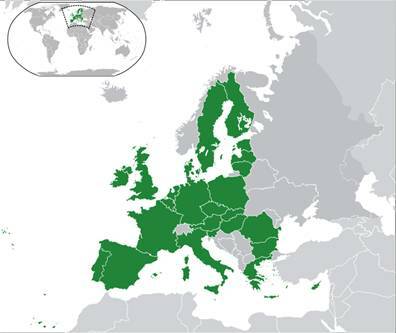 This was the first major revision of the Treaty of Rome and set the agenda to establish a Single Market by 1992. A common external tariff was imposed at this time. In 1990, the former East Germany became part of the Community as part of a newly united Germany. 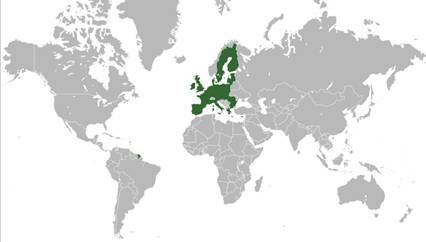 The European Union was formally established when the Maastricht Treaty came into force on 1 November 1993, and in 1995 Austria, Sweden, and Finland joined the EU. In 2002, euro notes and coins replaced national currencies in 12 of the member states, making it unique among trading blocs in establishing monetary union. In 2004, the EU saw a major enlargement from 15 to 25 members when Malta, Cyprus, Slovenia, Estonia, Latvia, Lithuania, Poland, the Czech Republic, Slovak Republic, and Hungary joined the Union. On 1 January 2007, Romania and Bulgaria became the EU's newest members. The eurozone increased to include sixteen countries with Slovenia, Cyprus and Malta, and by Slovakia adopting the euro. With over 500 million citizens, the EU countries combined generated an estimated 21% of the world's total economic output in terms of purchasing power parity, which makes it the largest economy in the world by nominal GDP and the second largest trade bloc economy in the world by PPP valuation of GDP. The EU is likely to see additional enlargement in the next few years. Other countries wanting to join include Croatia, Iceland, Serbia, Macedonia, Albania and Montenegro. The membership bid by Turkey has become the major controversy of the ongoing enlargement. Turkey has been an associate member of the EU since 1963. It was one of the first members of the Council of Europe in 1949, and was also a founding member of the Organisation for Economic Co-operation and Development (OECD) in 1961. Opposition to Turkey's membership results from its long standing dispute over Cyprus, concerns about democracy and human rights in the country plus the issue of it being a relatively poor country by EU standards. Another major barrier to membership is the fact that, although Turkey is a secular state with no official state religion, 99 percent of the population is registered as Muslim. If Turkey is ever accepted EU, it would become the first Muslim nation to do so. However, strong elements in Germany, France, and the Netherlands oppose Turkey's bid.